Custard & Crumble are proud to be offering this range of hand finished personalised canvas wall hangings by The Dotty House. They make perfect gifts for a new baby, Christening, birthday or any other celebration. 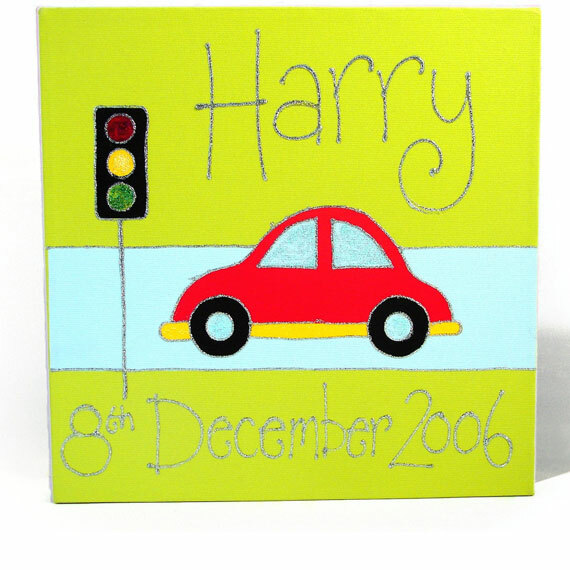 This bubble car will look fantastic in any little boy’s room and is available in 12″ x 12″ and the canvas is 3.5cm deep, gallery wrapped with no visible tacks.The design is hand finished with a gorgeous sparkly effect, and the child’s name and date of birth is added in glitter. Just enter the name you require in the box below & the date or message in the date of birth box. If you would prefer just a name then leave the DOB box blank. Please ensure that you enter the name and date accurately as we cannot accept returns due to customer errors.